A rowdy “Irasshaimase!” is not what you expect to hear on a rainy night on Lygon St. Usually it’s “Any garlic bread with that?”, or possibly “Welcome to Grill’d”. But this is the new-look Lygon—no longer just a place where uni students eat cheap pasta and Range Rover owners watch arthouse films. Lygon is changing, and it’s places like Shinbashi leading the charge. Believe it or not, this is the second Japanese restaurant to open in Carlton in less than a month. The other is French-skewed Torissong (also excellent). We’ve even had ima doing minimalist Japanese brunch. Shinbashi is a little different though: this is a traditional yakiniku restaurant out of Brisbane. Owner and chef Charlie Cheng (great name) has been running the BBQ eatery up there for 10 years. This is the first time he’s migrated down to Victoria. “I think Melbourne deserves more yakiniku joints that really focus on the quality of meat and the education of traditional yakiniku culture,” he says. 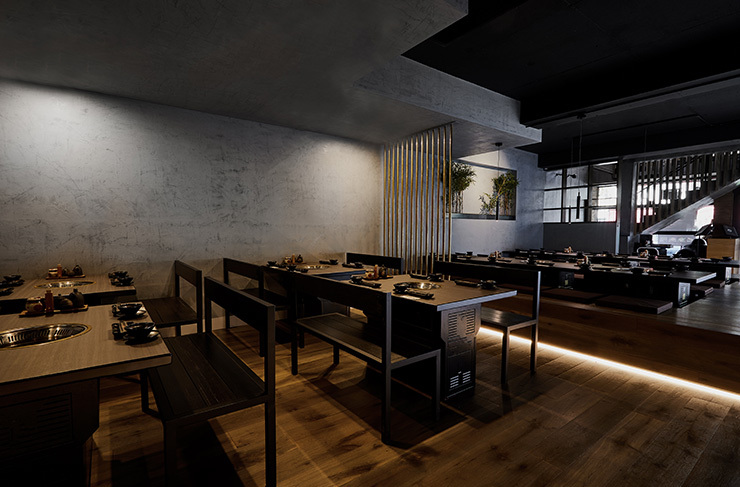 The fit-out at Shinbashi is classic mod-Tokyo, all moody charcoal tones, brushed concrete, copper dividing walls and red lanterns. 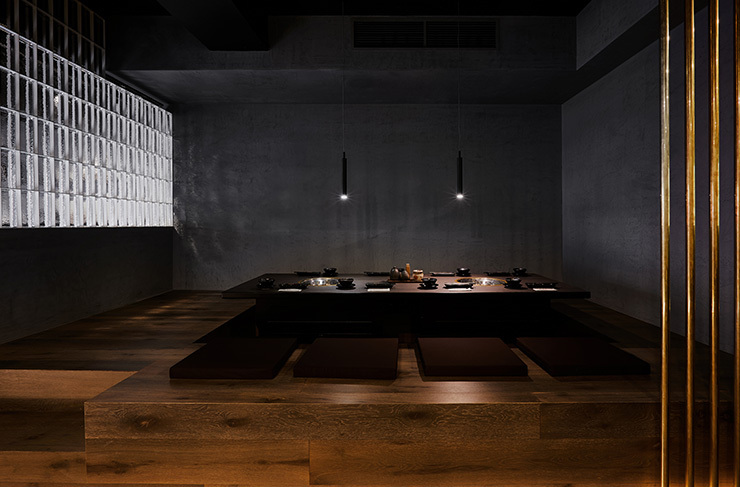 There’s a very swish private room off to the side (good for functions), and you’ve got the choice between bench seating or tatami-style dining on the floor. We recommend doing it like the Tokyoites do and going tatami—just remember to wear matching socks. You’ll need to leave your shoes in the cubby provided. There’s a couple of ways you can approach Shinbashi. If you’re dining from Thursday to Sunday, that’s going to be a la carte. On Monday to Wednesday, you have the pants-busting option of All You Can Eat (more on this later). Shinbashi’s a la carte is all about quality over quantity. Cheng has sourced some of the best Australian Wagyu going around, including David Blackmore and Sher Wagyu up in Ballan. If you want to taste the best beef of your life, order up the M7+ Wagyu Dice and M9+ Wagyu Sirloin. This is getting into rare air. The only way to make a cow taste better would be to feed it nothing but truffles and Evian. For something a little less pricey, the Wagyu Deluxe Trio is a good way to—that includes premium Wagyu oyster blade, Wagyu short rib and Wagyu marbled beef. ⚠️ PSA! Thanks to the overwhelming support from you guys, evening table bookings are STRONGLY RECOMMENDED for the next couple of weeks. Please be sure to reserve your seat via our website/ Zomato/ calling us on (03) 9347 3528 to avoid disappointment! But how do you cook all this premium cattle? That’s where the yakiniku bit comes in. Each table has a cavity in the centre, where the waiters place a brazier of glowing, white-hot coals. The heat radiating off is enough to singe your eyebrows. A thin wire wrack goes on top, and that’s where you place your sizzling beef/chicken/pork belly/vegetables. The trick seems to be knowing which fatty cuts are going to flame up and set off the sprinklers. The waiters will give you guidance on the various cuts. The basic rule seems to be: grill till you see moisture on the other side, flip once, then eat. Vegetables cook slower, so place them around the sides. Each table comes with a bunch of condiments, including tare sauce and Togorashi chilli. Word to the wise: your yakiniku grill spits flame and smoke and the aromas of cooking meat all night, so maybe leave the ball gowns and tuxedos at home. There’s risk of splashback, and whatever you wear will probably be perfumed with beef (personally we think that’s a bonus, but whatever). Mon-Wed wagyu BBQ all-you-can-eat special (with over 50+ menu options) is back in @shinbashi_melbourne ��! Reserve your seat via our website or give us a call ��. We can’t wait to meeting you all ❤️��‍♂️! The ace up Shinbashi’s sleeve is the new all-you-can-eat menu. It came about by accident: Cheng and the team were having a post-service dinner in Brisbane and someone asked “How much of this Wagyu do you reckon you could eat?” A light bulb appeared over Cheng’s head and the rest was history. Here’s how it works: you pay $60 a head, and that gets you literally plate after plate of meat and vegetables. You can order lamb ribs, chicken thigh, Wagyu harami and thin-sliced ox tongue (for the brave). The menu even includes sashimi platters. Honestly, if you arrive here with an appetite, you can probably wolf down a good $100 worth of meat and seafood. Drinks and entrees cost extra, but who’s complaining? Speaking of entrees, the croquets and takoyaki octopus balls were both smashing. Technically the all-you-can-eat menu doesn’t feature the A-grade cuts (apparently this would have ballooned the price out to $80-$90pp), but it’s still premium Australian Wagyu. And if you want to tack on a few slices of M7+ marble, you can go nuts. We leave Shinbashi much heavier and happier than when we arrived. This might not be classic Lygon St food, but it’s nice to see people shaking up Carlton’s main drag. When our stomachs have recovered, we’re coming back to tackle that M9+ Sirloin. Want to learn more about Shinbashi? Check out our Directory page.